Are you visiting Israel soon? You’ve probably heard that one of Israel’s best-known features is its gorgeous beaches. Israel stretches along the Mediterranean Sea, and therefore has a very long coastline compared to its size – 273 kilometers in total. The country’s sandy golden beaches go all the way from its north to its south, showcasing different features in different locations: from sandy dunes and urban beaches to tall cliffs and rocky beaches dotted with tiny, shimmering pools. However, not all Israel beaches lie next to the Mediterranean! In fact, some of the best beaches in Israel are actually well hidden inside the country. The Dead Sea, located in the south east of Israel, somewhere between the capital city, Jerusalem and the largest city in the south, Beer Sheva – has some of the most beautiful beaches in the country. Aside from it’s beautify, Dead Sea is also famous for it’s numerous skin and health benefits due to the salinity level of it’s mineral-rich waters. So if you are visiting Israel, you should definitely consider going to this unique and incredible place. In fact, we would highly recommended to stay at the Dead Sea for a couple of days to fully experience all the incredible benefits of it’s unique natural spa (time to visit booking.com!). 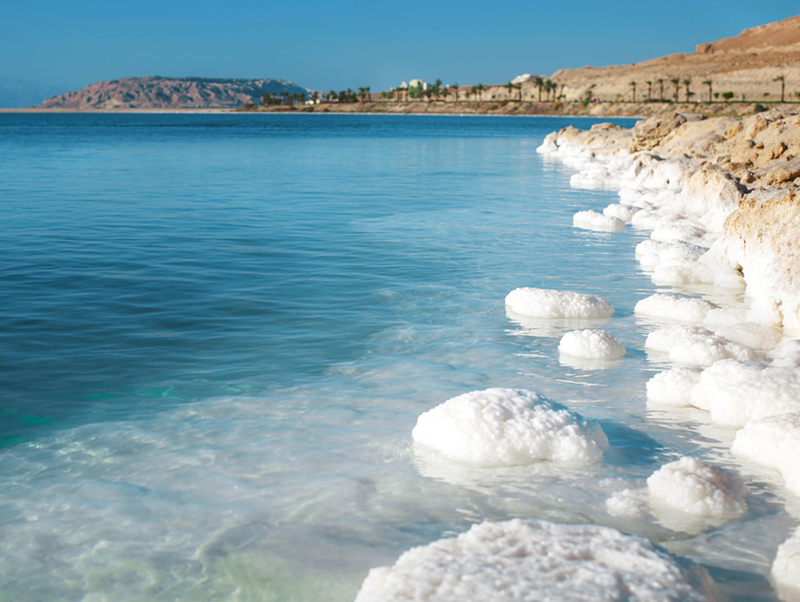 Curious to learn more about Dead Sea beaches? We’ll start at the northern tip of the Dead Sea and work our way to the bottom. Kalia Beach – Kalia Beach is the beach operated by Kibbutz Kalia, a small, peaceful kibbutz established in the 1970s. It offers magnificent views of the sea and the desert, and has several facilities for tourists, including a restaurant, a bar and a gift shop. It is very family friendly, tourist friendly and safe. There’s also natural black mud you can rub all over your body for its beneficial properties. Neve Midbar Beach – Neve Midbar beach belongs to the Megilot Regional Council and is very laid back. It offers a spacious stretch of sand, green lawns, barbecue area, a gift shop and a bar. It usually attracts a younger crowd. Biankini Beach – Biankini Beach is located right next to Neve Midbar Beach. It is part of a Moroccan style resort, which also includes a Moroccan restaurant and bar, complete with Moroccan music, belly dancers, karaoke nights and live shows. It is very popular among Israelis, and some tourists might also enjoy the experience. During holidays and weekends it tends to get quite crowded. Ein Gedi Public Beach – Ein Gedi Beach is located next to Kibbutz Ein Gedi, in the central part of the Dead Sea. Entrance to the beach is free and it offers basic facilities such as toilets and showers, as well as a picnic area. It is more rocky than sandy so walking on the beach requires some kind of footwear. The southern area of the beach has natural black mud which is great for the skin. The beach also has a large area designated for tents, for those of you who like to camp out. Unfortunately, due to sinkholes, Ein Gedi Beach is now closed until further notice. Ein Gedi Spa Resort– Ein Gedi Spa Resort offers six Sulfur pools, a natural mud area, spa and beauty treatments, a restaurant, a café and a swimwear store. Ein Bokek – Ein Bokek Beach is the one that lines the Dead Sea hotels area. It is mostly free of charge. This is where you’ll find glitzy resorts and pampering spa treatments as well as fancy hospitality and high-quality restaurants. The beach itself offers beach chairs, picnic spots, a restaurant, a refreshment stand and a beauty products store. Zohar Hot Springs Beach. Just south of Ein Bokek you’ll find Zohar Hot Springs Beach, which is free of charge and offers a wide shore, showers and other facilities such as lifeguard services, reclining chairs, toilets, a tent area and a refreshment stand. Another famous Dead Sea beach is Mineral Beach, however, at the moment it is closed until further notice due to sinkholes. Each beach offers a different experience, so it’s actually best to sample at least two or three. The three best beaches are considered to be Ein Bokek, Kalya and Ein Gedi; however Ein Gedi is currently closed. If you’re staying in a Dead Sea hotel, you’ll be close to Ein Bokek beach anyway, so a great option would be to visit the Zohar Hot Springs Beach which is quite close, as well as one of the northern beaches. Wondering whether you can get a nice suntan in the Dead Sea? Well, the answer is – of course you can! The Dead Sea gets 330 days of sunshine a year so it’s quite easy to get a tan no matter the season. The sunlight is considered weaker than in other areas of Israel because of the very low altitude, however, getting sunburn and/or getting dehydrated is still possible, so make sure to use sunblock whenever you’re outside and wear a hat and sunglasses.